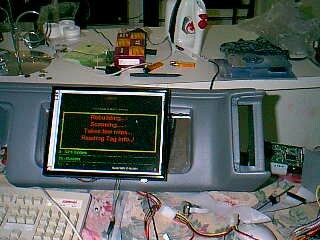 Here is the Single Board computer (Advantech 5862 I believe) running at 200 MHz with 64 Meg of RAM. 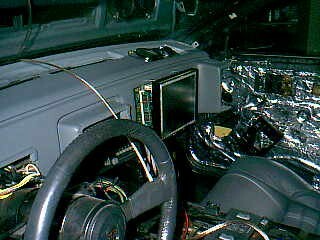 It's installed in the map pocket area of the Fiero Dash with a Plexiglas mirror as the background. All of the cabling wraps around the board into a cut out behind the computer to run under the dash. Here's a shot of the 10.4" LCD Display and the control equipment (Power Supply, Hard Drive, and NewQ controller mounted in a radio installation kit for the Fiero). 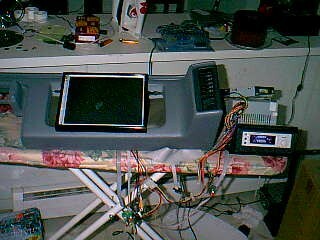 You can also see my Hi-Tech folding workbench, i.e. Ironing Board. Don't laugh! It was the only thing I had that was long enough to support the dashboard in the house short of bringing up the ungodly heavy banquet table, which I don't even do for company. On the initial run of Cobra III, I had to find all the music and movies preloaded on the hard drive. It's obviously working and really only took 2 minutes to find 1200 songs and another 1 minute to find over 200 Music Videos. Not bad for a throwaway compact computer system! 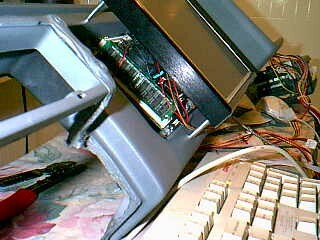 Truth is, it's running Windows ME Uggggh! But I have learned to tweak the Windows boxes pretty darn good, so, I guess I'll live with it. Ok, now that all the movies and music are found, it comes time to test the picture scan speed. The SBC needed more video RAM, as 1 MB wasn't enough. I just so happened to have an old video card lying around that happened to have the "extra" memory I needed. I popped it out of the video card and into the SBC and it now works flawlessly! There's something to be said about keeping old parts lying around! Here you see Eminem's video "Without Me". Ok, here's how the LCD is attached to the dashboard. I'm using 2x 3/4" standoffs on all 4 corners to give the ventilation needed to the computer. Only 1 1/2" off the dash isn't bad at all. 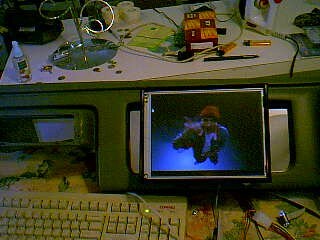 That is a picture frame that I had made at Hobby Lobby to hold the LCD. Now, how to hold the picture frame. A combination of 1 washer slid into the track on the backside and another washer on the outside of the track all screwed together forms a nice jam connection that is very firm and will not let go, no matter what I do to it. I can literally pick the dash up by the picture frame and be fine, which is what we need. Now that I know the system is working after I put it in the dash, it comes time to put the dash back in the car for the initial mock up. You can see a pretty good shot of the system and how close it is when the seat is in the forward most position. The silver stuff on the doors is the sound deadener called "Brown Bread" This stuff rocks and it's much less expensive than Dynamat or any other equivalent. At $150 for 70 Sq. Ft., it took care of the entire car with 2 layers on the floor with no problem. 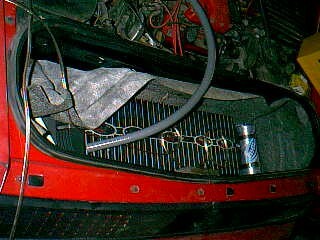 The wire coming out the center of the dash is for the JBL Center Channel speaker and I have chosen the MB Quart 4" components for the mains. From this vantagepoint, you can get a good look at my new leather seat covers from Mr. Mike's and the custom built 15" Cerwin Vega Stealth Series Sub. The nice part is that I can remove the sub at a moment's notice if I'm to have company in the car. Quick disconnects are a wonderful thing! To cover the bottom end in the car with company, I have a Bazooka tube that fits very nicely back there as well, though it lacks the awesome power of the 15". What you can't see in this pic is the pair of Fosgate 3 1/2" in the headrest of each seat. These fill out the image very nicely. With all of those speakers, you need juice to bump them! Here you can see the 3 Fosgate Amps and the Scosche 1 Farad capacitor that power them. Hidden under the carpeting that is folded over is the Audio Control Center Channel Processor. While the boxes of the amps say that there is 500 watts worth of amps in here, the birth certificates of the amps total out to 700 watts of power as tested. 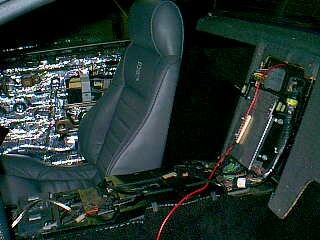 All this in a Fiero. This is gonna be one VERY loud car with some nice, clean sound to boot. The gray tube you see is the flexible aluminum conduit the cables will all be run through for protection. The install is still progressing with wiring as of right now. I'll be adding onto this article as it is completed.